Father’s Day is right around the corner, June 19th to be exact, and you may be racking your brain trying to figure out what to give your pickup truck driving dad. Visit your local big-box store and you’re bound to find an automotive aisle filled with useless travel accessories, floor mats, and every possible sort of gadget to help Dad wash his truck. But getting floor mats for a Father’s Day gift feels a bit like giving him a tie, doesn’t it? Why not get him something special that he could really use every day: the best truck bed liner! One of the best Father’s Day gifts you can give this year is a DualLiner. If your Dad does any sort of hauling in his truck, a bed liner is an absolute must to protect against scratches, dents, and dirty payloads that can damage the surface inside the truck box. But not all bed liners are created equal. Many, like plastic drop-in liners can even make the problem worse. These single-piece units will slide around and scratch the paint surface underneath. And when the paint is scratched, it’s an open invitation for rust and corrosion to start eating away at the structure of the truck! Spray- in or roll-on bed liners aren’t much better. Before they’re even installed, the paint inside the cargo box needs to be scuffed which voids your factory warranty on your truck’s paint finish. And the install isn’t easy, either: it has to be installed by an OSHA regulated installer. There’s no way to do it yourself. Also, once you have a painted-on bed liner, there’s no way to remove it, even if it becomes damaged by a load, or starts to peel or chalk from being sun baked over time. Plus, would you want to receive an appointment for a gift? We didn’t think so. DualLiner is more than just another bed liner, though. DualLiner’s dual-technology modular construction will keep your loved one’s pride and joy in like-new condition. The custom-fit, UV-protected side walls match the contours of his truck’s specific bed shape, eliminating the chance for them to slide or shift and damage the paint underneath. They also minimize the hollow voids you can find in the corners of drop-in liners that are notorious weak spots. In the same way, the ZeroSkid rubber mat covers the bottom and prevents payload from sliding around and getting damaged from colliding with the bed walls. Even spray-in liners can’t say that. Those non-slip coatings are often too abrasive for fragile payloads. 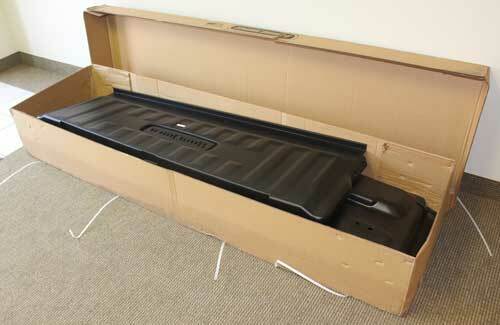 And to top it off, you can pull the ZeroSkid bed mat out if you want to install or make use of a fifth-wheel hitch. Try doing that with a spray-in bedliner! Even if you’ve waited until the last minute, DualLiner makes a great Father’s Day gift. It’s available for a variety of trucks and it only takes a few days to arrive. We even provide free ground shipping within the continental United States. And when Dad opens it, he’ll be able to enjoy it right away. The installation only takes about half an hour. It’ll protect the bed of his truck and what he decides to put in it. So get that special guy in your life the best bed liner this Father’s Day; get him a DualLiner. Just think of the presents they’ll be able to haul next year! Next story What Do Spray In Bed Liners Cost, Including Line-X or Rhino? Hi Joaquin, we are Dual Liner, a different company than Duraliner. Our liners are 5 pieces that are custom fit to the contours of the truck with a heavy-duty rubber floor. The DualLiner does have molded-in pillars that match the truck sides, those are used for 2 x 4 boards to help partition out the bed. If there is something else we can assist you with, please contact Customer Service, Monday – Friday 8am to 5pm CST at 800-992-1949.